She found an impressive roster of pop stars to join in on the vocals: Tom Petty, Billy Idol, Willie Nelson, Don Henley, Peter Gabriel. She orchestrated her songs with the instruments of pop music: synthesizers, drums, bass, electric guitars. But Joni Mitchell was about as likely to turn her 15th album into a typical pop record as she was to go into politics as George Bush's running mate. CHALK MARK IN A RAIN STORM is yet another of Mitchell's brilliant and difficult albums, full of her strange harmonies and meandering melodies that replicate speech patterns. An accomplished oil painter, she uses the recording studio as a giant palette for blending sounds as if they were colors. Having first explored electronic music on her 1985 album DOG EAT DOG, Mitchell delves even more deeply into the prismatic tones of that style. Billy Idol's voice seems an intentionally awkward ember-red splotch, Peter Gabriel's becomes a sort of sea green that wraps around Mitchell's tones till the two are indistinguishable. Meanwhile, chopping away at the conventional song form, Mitchell (who co-produced the album with her husband, bass player Larry Klein) replaces the lush, clever lyrics of her past albums with minimalist phrases that recur like mantras. Nor does she so relentlessly chronicle the self as she has in the past. Her new songs cover a broad range of topics: the battle scars of a veteran, the false promises of advertisements, the emptiness of a social climber's marriage and the pain of Indians vanquished by industry: "Tell me grandfather/You spoke the fur and feather tongues/Do you hear the whimpering waters/When the tractors come?" 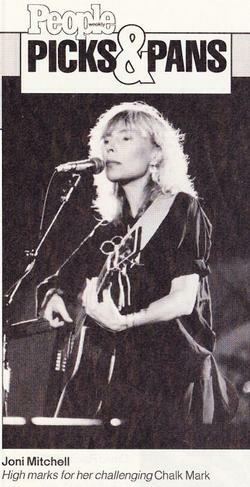 In a few cases, Mitchell seems to have focused too much on production, while allowing her lyrics to become disappointingly mundane. NUMBER ONE takes only a wavering aim at the way people struggle for success, particularly when the song is compared with her 1972 FOR THE ROSES. On the other hand, A BIRD THAT WHISTLES, an adaptation of the traditional CORRINA, CORRINA, may be the sweetest, simplest song that Mitchell has ever recorded. This article has been viewed 5,399 times since being added on March 8, 2000.